RestoringVision is off to a great start this year, thanks to you! We are now in our 3rd year of an ambitious 4-year goal to help 20 million people see clearly by 2020. This year specifically, our goal is to reach 3.2 million people. In the first two months of the year, 25% of orders for glasses came from new partnerships. This means that more people are learning about this global health problem and taking action to make a difference. Our partners have also shared that by adding glasses, their programs have been enriched. This year, we have several key initiatives that we set into motion in 2018. These include our work with partner organizations in country, their local governments and ministries to develop programs that provide reading glasses to people living in rural and impoverished communities. These programs are being developed in Bangladesh, Colombia, Mexico, and Peru. We also have been focusing on growing collaborations with US based programs – both large and small and organizations conducting outreach trips. The importance of these programs is their capacity and ability to reach some of the most remote areas of the world. Partners are at the core of what we do at RestoringVision. We know that we could never solve a global health problem of this scale by ourselves. For that reason, we rely on service delivery partners, donors, and funders to help us advance our mission to transform lives by restoring vision for millions of people in need. Thank you for being on this journey with us and for your support and contributions. We couldn’t do it without you. A RestoringVision volunteer providing reading glasses to a young woman carrying her baby. Earlier this month, RestoringVision Director of Strategic Partnerships, Mac Humphries, visited Guatemala with two of our institutional donors: FGX International and the Shelter Hill Foundation. 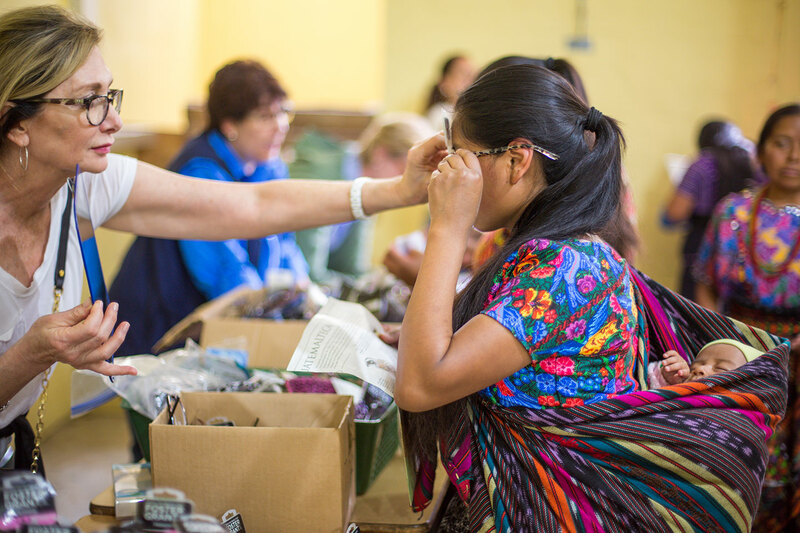 Thanks to our service delivery partners, Food For The Poor and Caritas of Guatemala, the group was able to experience first-hand the extraordinary impact that reading glasses have on people living in impoverished communities. Click here to read the full newsletter and learn more about our trip to Guatemala.